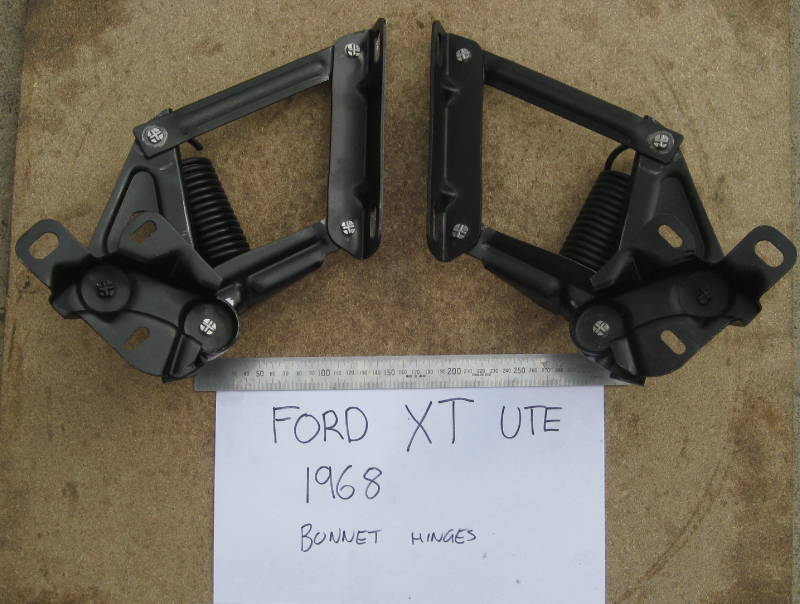 We recondition all car door and bonnet hinges which have been worn. We re-machine and replace with new rivets to suit in hinges so that they function correctly. We repair hinges to allow doors and bonnets to be closed properly and not be loose. Perfect for restoration of cars. 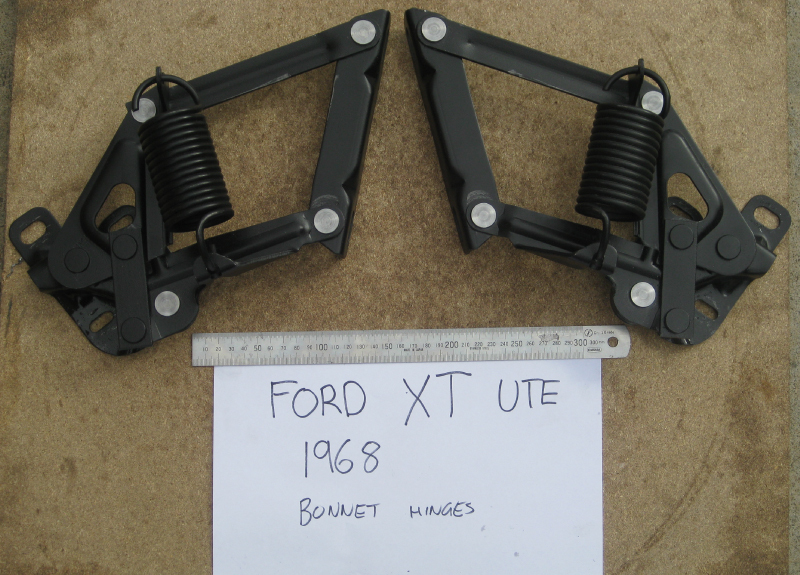 We also provide hinge repair services to panel beaters and those involved in car restoration. 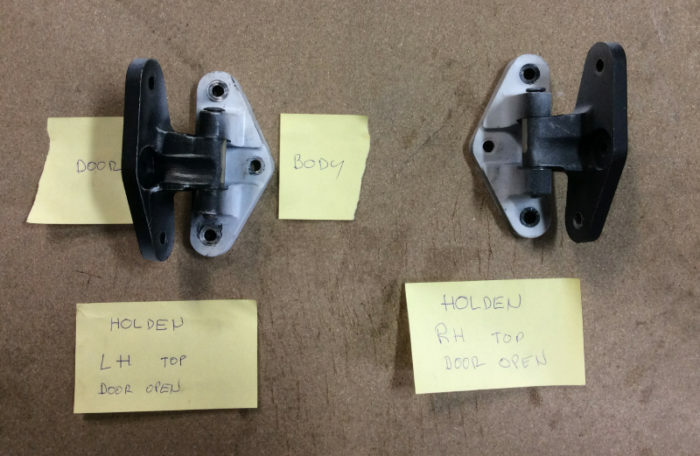 We have repaired door and bonnet hinges for Holdens, Fords, Toyota, Mazda, Nissan, Datsun, Valiant, American cars, English Cars and many other makes and models etc. We manufacture new rivets and press & swage them to look authentic with their original manufacture. We can also manufacture and replace any pins or studs as required. And nearly all other cars! 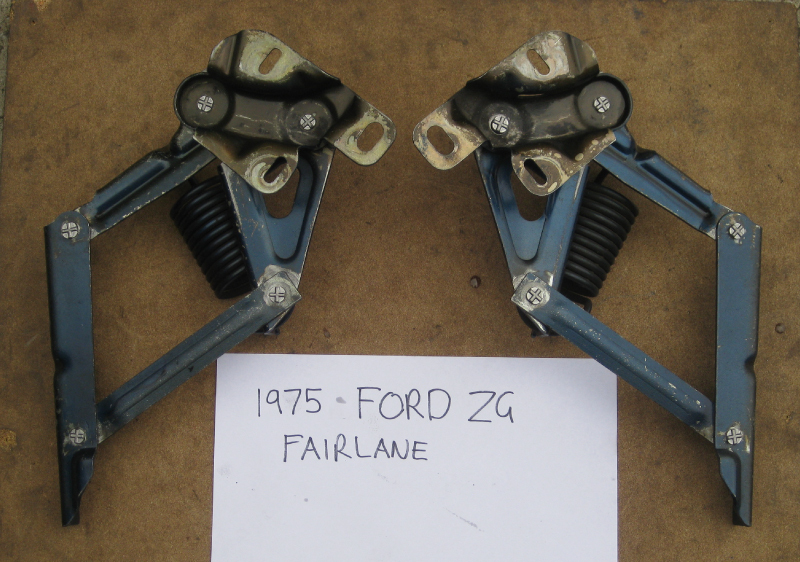 As we commonly recondition Holden and Ford bonnet and door hinges and some American cars we can offer a fixed standard price. 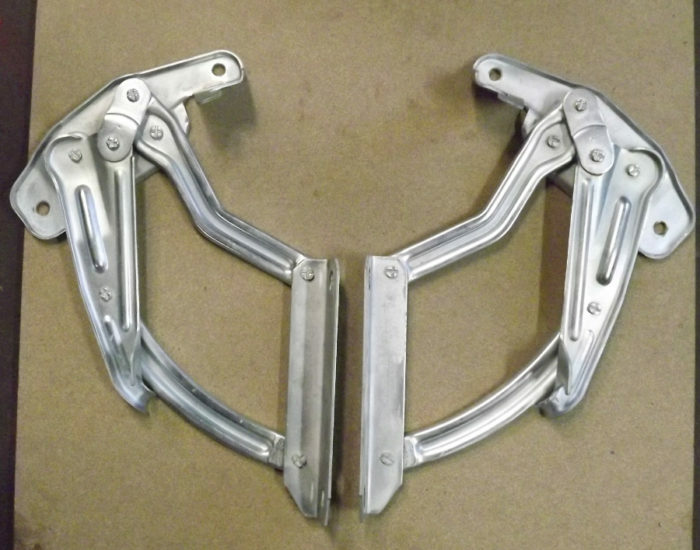 We aim to be reasonable in pricing, but if we require special tooling to be made to suit a particular model hinge then the price may be a little dearer. 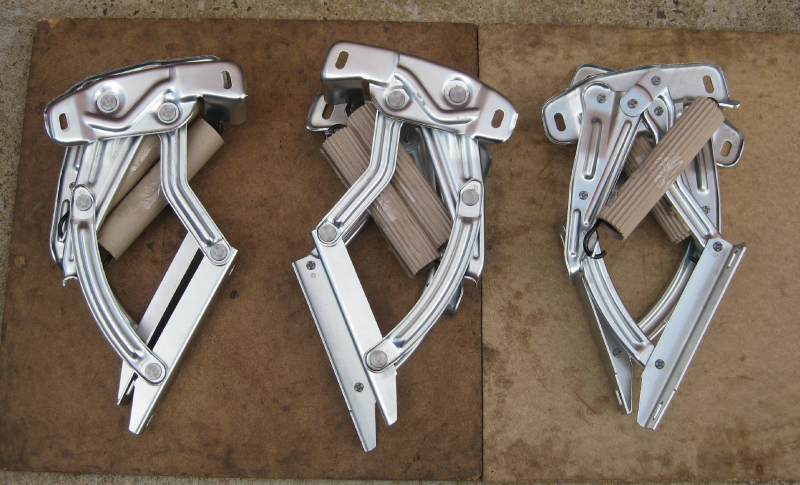 Lead time is approximately 2 -3 weeks from delivery of hinges to our factory (depending on our workload or urgency). 2. Your full return delivery address, with full post codes etc. 3. Your contact name and phone number incase we need to contact you. To SPEEDEX ENGINEERING. No. 34 Kolora Road. West Heidelberg. Melbourne. Victoria. Australia. 3081. 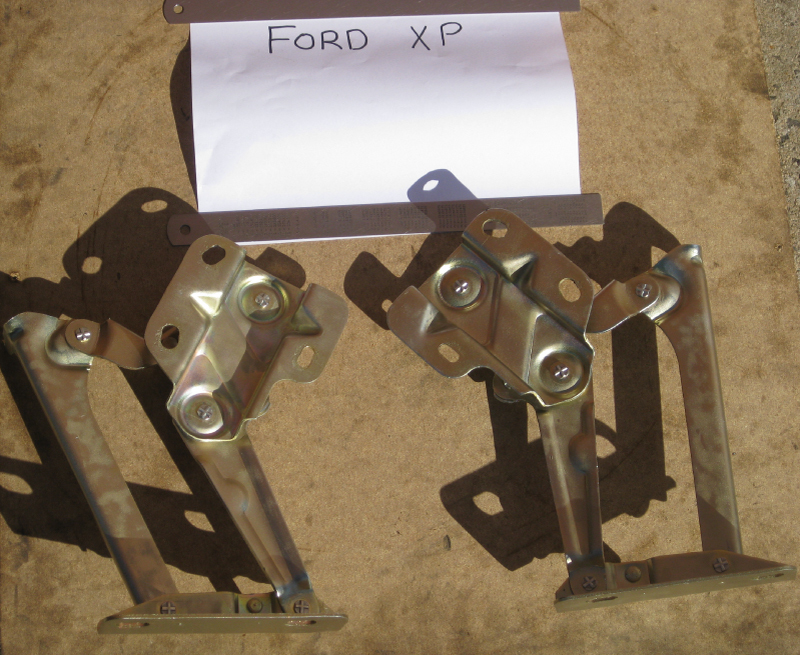 Note: regarding plating, we usually always have hinges zinc plated only as this is common procedure as per original car manufacturing process. 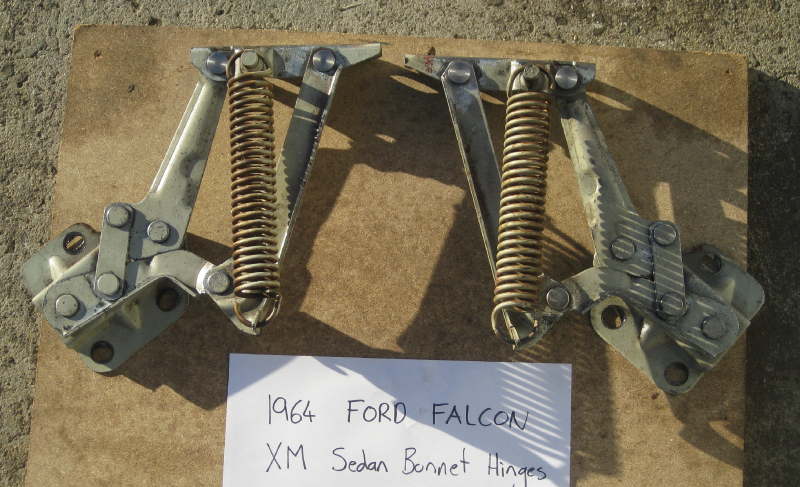 Original hinges are not usually chrome plated if not seen but restored cars today may want chroming of hinges in say bonnets or boots etc if you want to show them off. 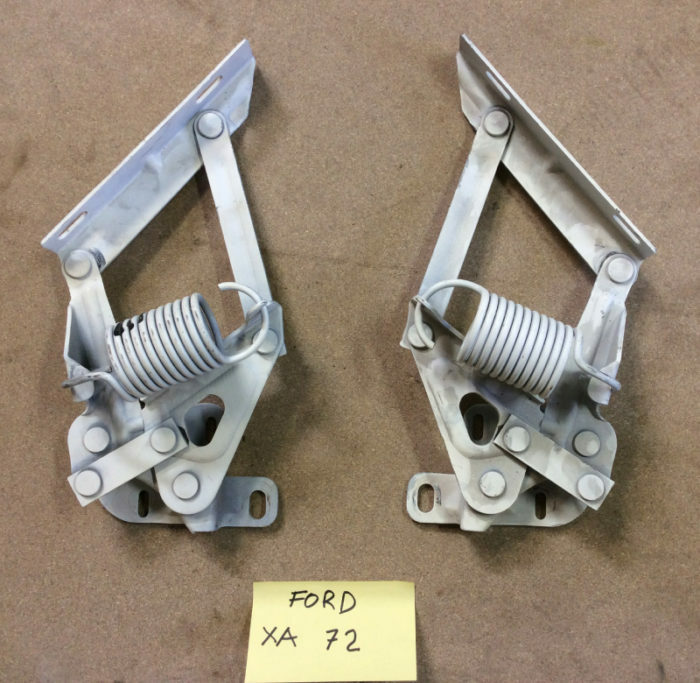 Hinges can usually be chromed plated in the condition that they are in, but if you want hinges chromed then please remember that the hinge parts look better if they are first polished all over. 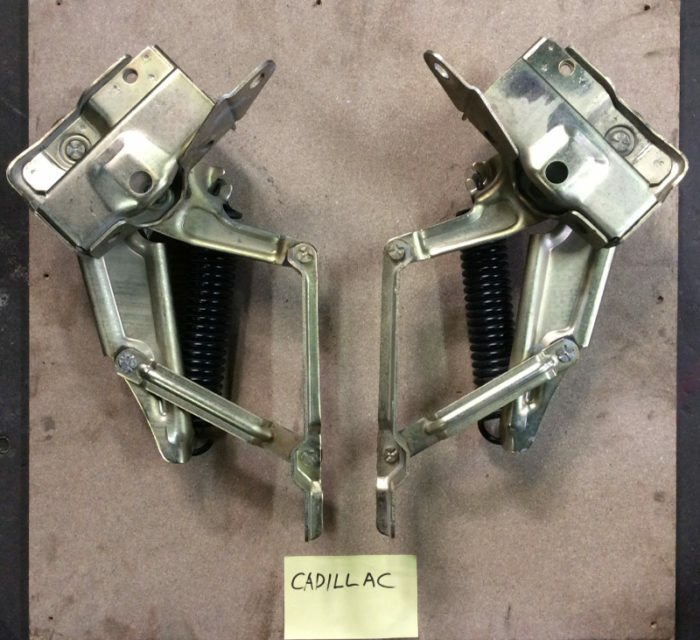 Should hinges be plated in fully assembled or plated as disassembled individual parts? 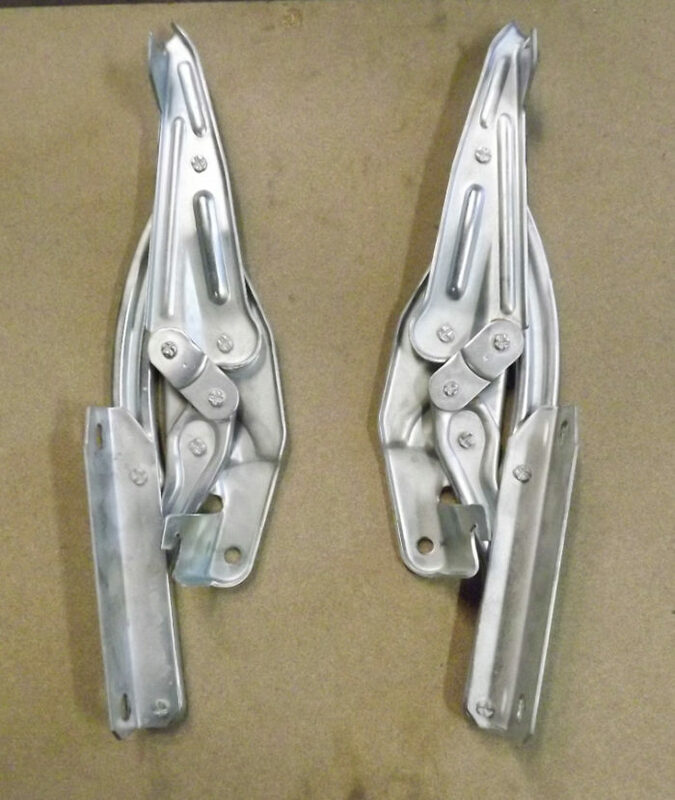 Plating of any car hinge usually looks much better when hinges are fully disassembled and sent of to platers as individual parts for the reason that when you try to plate a fully assembled hinge (even though it is easier) you will notice that the plating is uneven and does not fully coat all areas which are hidden, so hinges have areas not fully coated. This is not the fault of platers but that the plating doesnt penetrate all hidden areas. 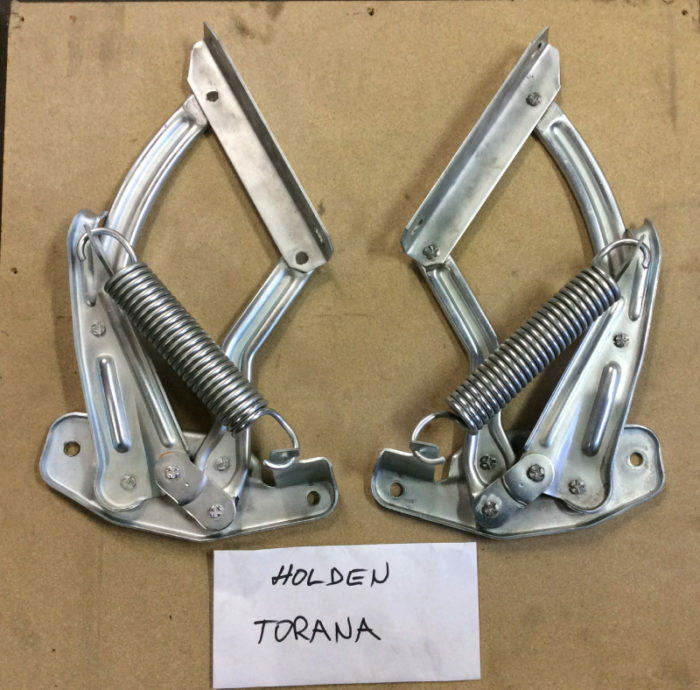 When we are asked to plate hinges we first carefully fully dissasemble hinges and send off to plating as individual parts so that all surfaces of all components are plated evenly all over and the final appearance looks much better than if they are not disassembled. 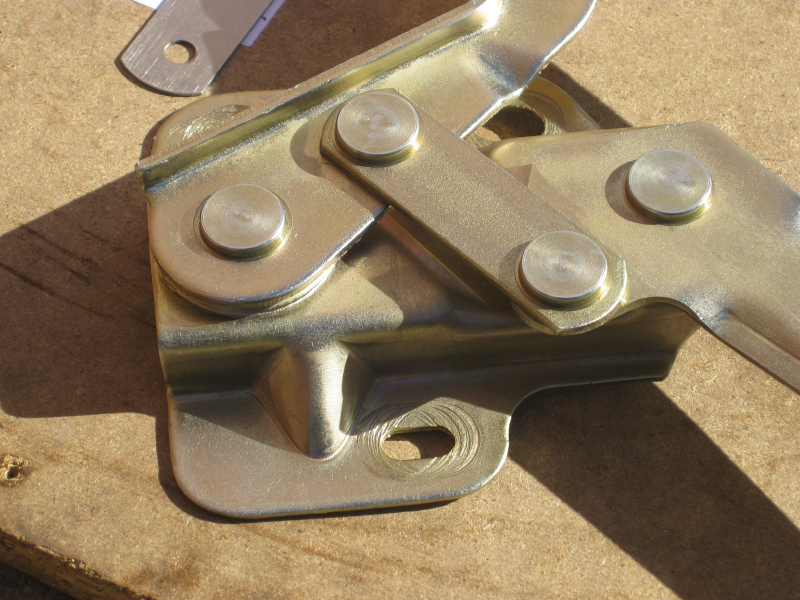 Basically you will notice that if you try to plate an assembled hinge then there will be areas which are lighter in colour or have not been fully coated. 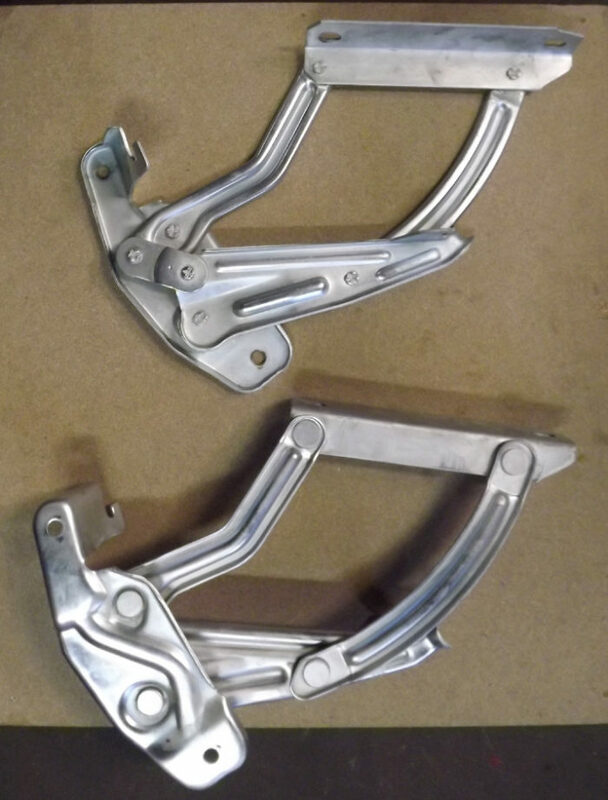 So if you are an individual, restorer we can dissamble hinges and have them plated or if you are a plating company and do hinges alot we can dissassemble and send back to you for plating and then re-assemble etc. 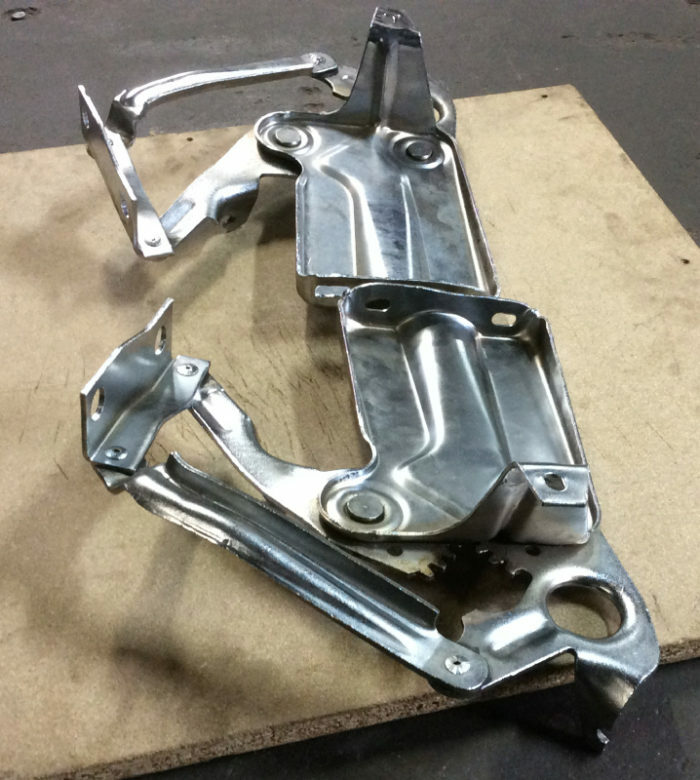 Also what is not often known is that hinges which are plated in assembled condition may have acid residue left behind by the plating/pickling process in the hidden areas around rivets and pivot points. Therefore they may look good but may not be oiled in critical areas and hidden areas may more prone to hidden corrosion around rivets themselves. 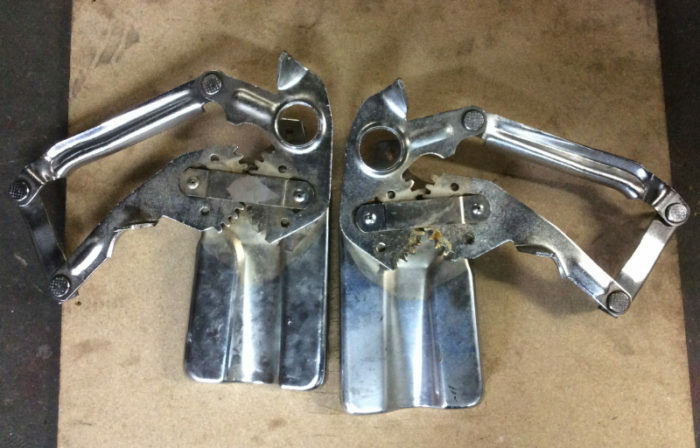 When hinges are sent off to platers as individual parts there is no acid left behind as all parts can be more easily and thoroughly cleaned up properly prior to re-assembly, and new rivets oiled properly. PLEASE NOTE: We have just started as of August 2018 to zinc plate rivets along with the hinge parts. 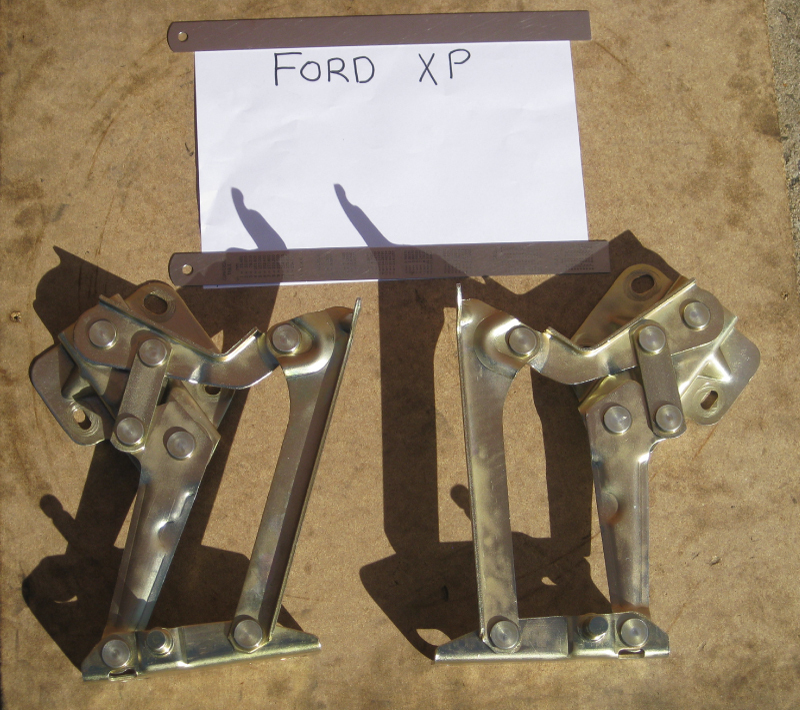 These following pictures of the Ford XP bonnet hinges show our rivets in place which were plated aswell as hinge parts. So we will hopefully start to also plate all rivets as a standard procedure in coming months. 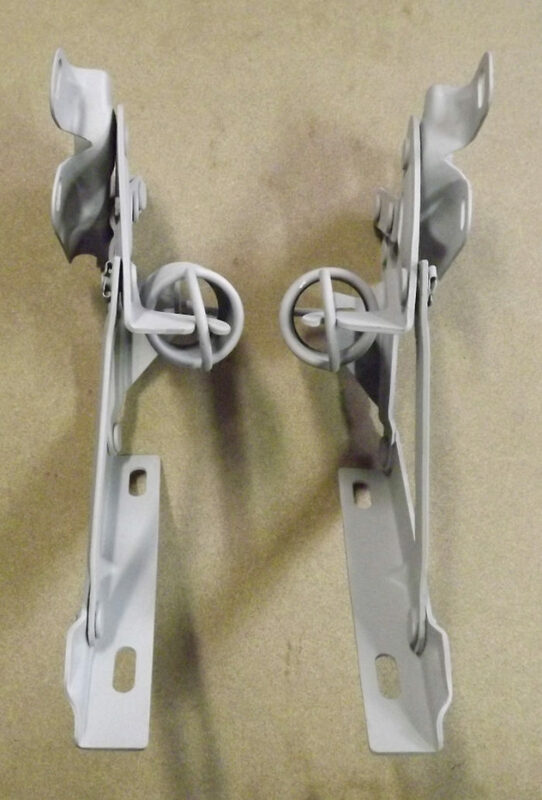 Please note that in addition to reconditioning the bonnet hinges themselves if we are asked to plate bonnet hinges we usually also clean springs up and paint springs aswell inhouse so everything looks new as shown in photo above. Springs can be plated by customers and sent to us, but we usually do not plate springs ourselves incase there is any hydrogen embrittlement issues and to avoid cracking them, unless customer accepts that springs may crack during plating and we cannot be responsibility incase this issue arises. This is why we paint them instead..but we can also plate if customers request it. Can we take springs apart and put back in? 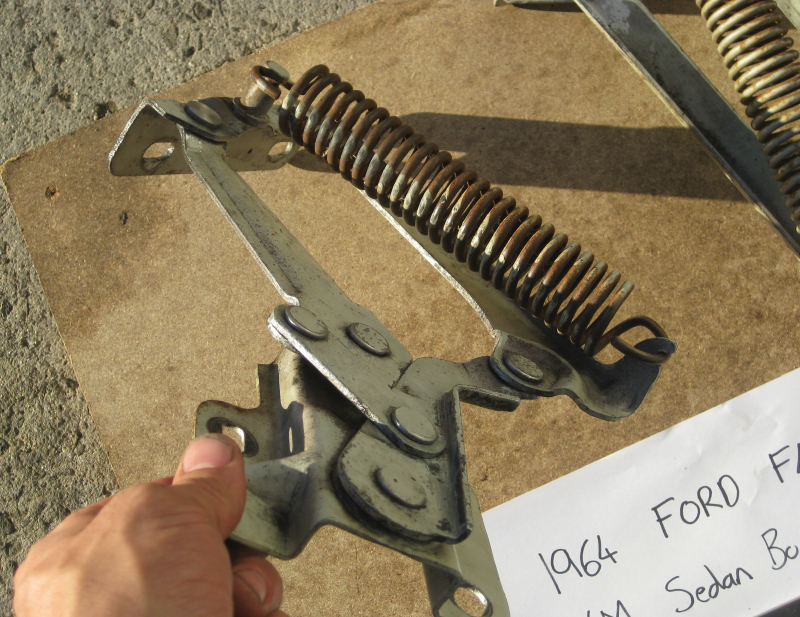 Yes we have special tooling that helps us remove springs and re-assemble them back into a hinge. 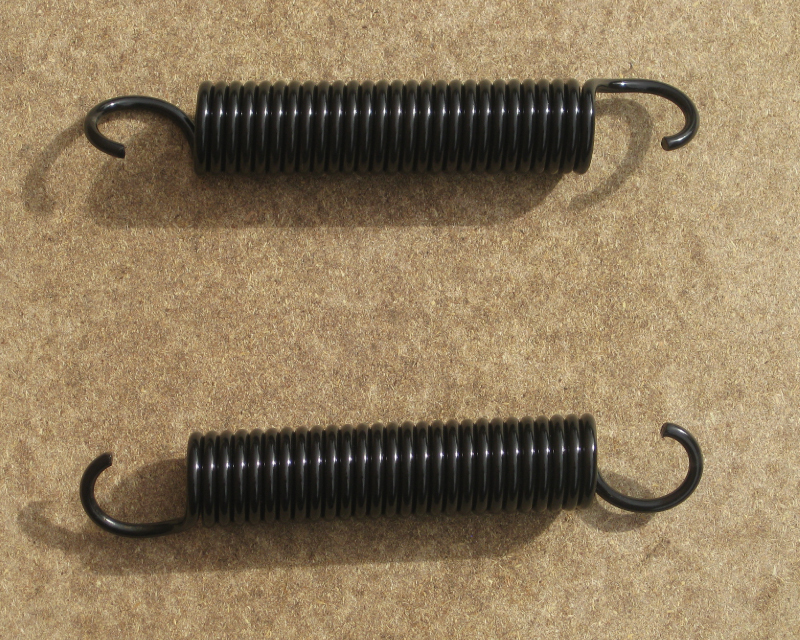 As anyone who has tried, springs are actually quite difficult to remove and put back together in a hinge without special tooling. 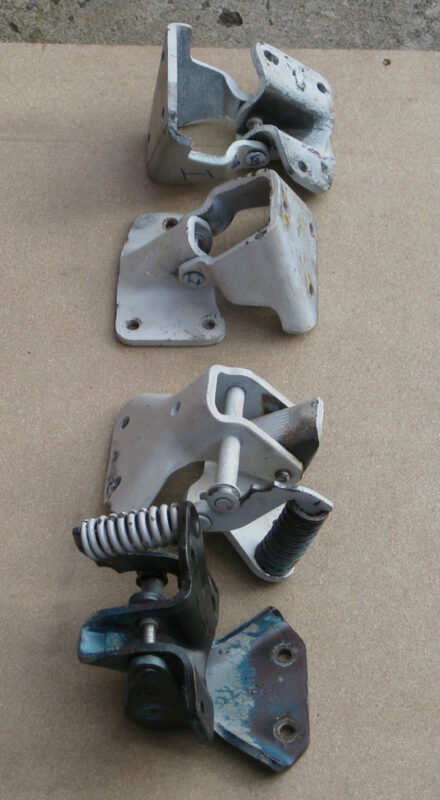 Can we recondition assembled or disassembled hinges? 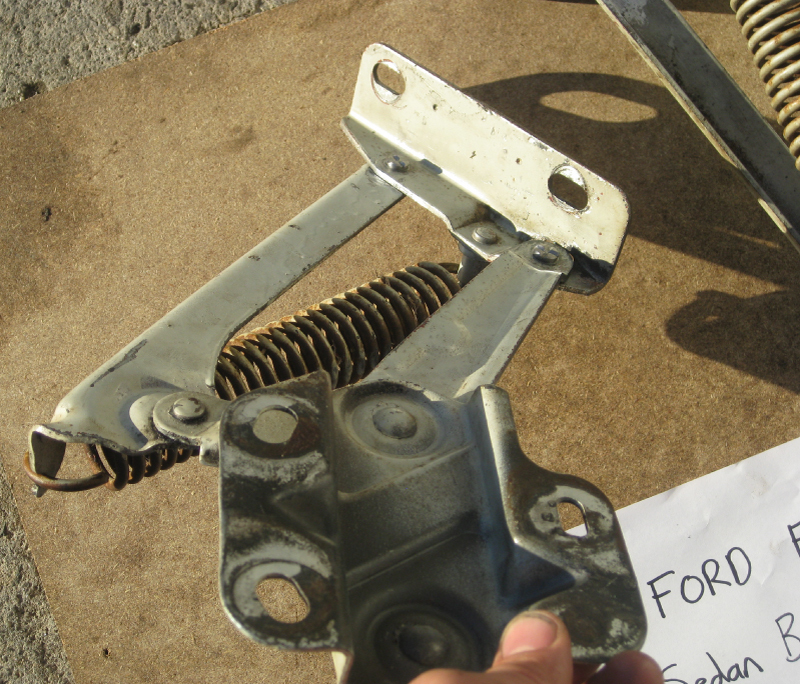 We usually only accept hinges to be re-conditioned if they are sent to us in fully assembled condition. The reason for this is that we have a special method and tooling to carefully remove rivets and take hinges apart without damaging the individual hinge parts. It is not a good idea to take an angle grinder to remove rivets as even if you are very skilled at metal work you will most probably damage or leave unavoidable grinding marks on the hinge parts. We also require rivets to be as intact as possible prior to disassembly. Also when hinges are in assembled condition we can see where other problem are such as where they are bent out of shape and rivets locations where they are worn and loose. 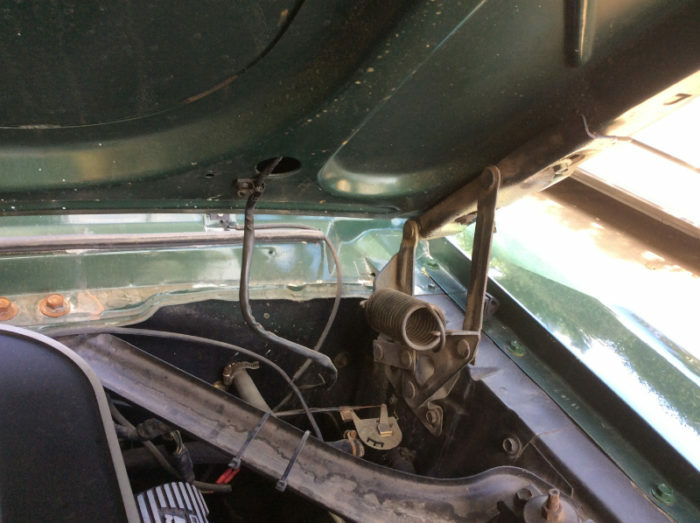 Do we recondition a pair or individual bonnet or door hinges? 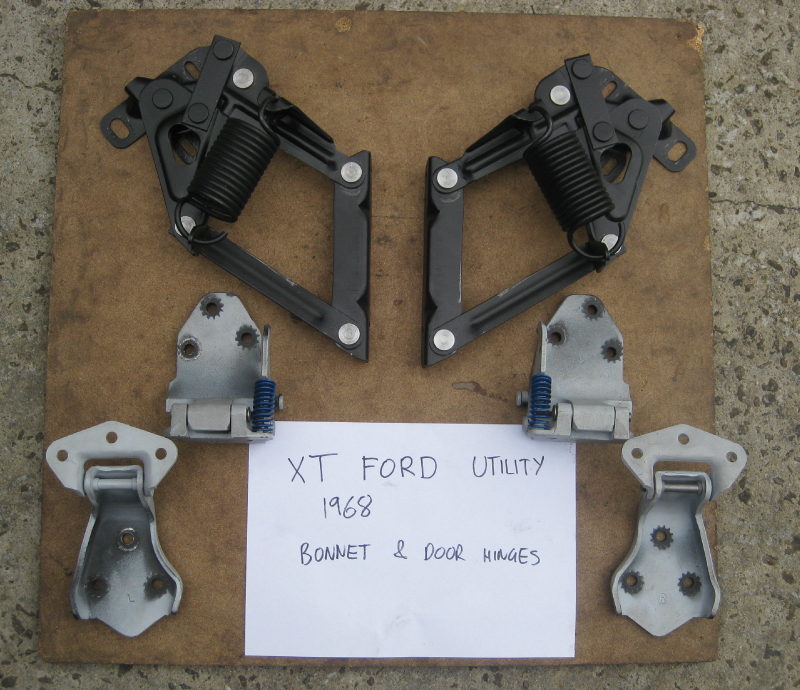 We usually only accept bonnet and door hinges if they are sent to us as a pair as price is same and also it is best to re-condition both hinges and we may require a good hinge to look at to see how they are meant to function and for correct shape etc..
Do we lubricate bonnet and door hinges prior to sending? Yes we apply lubricating oil to all bonnet and door hinges prior to sending off. And we check that they function and move correctly without slop. 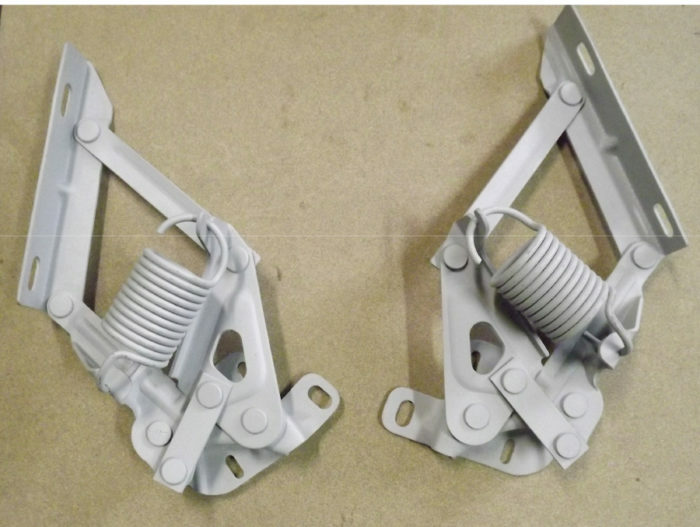 Some automotive hinges that we do repairs are are shown below. Many more photo's coming soon. 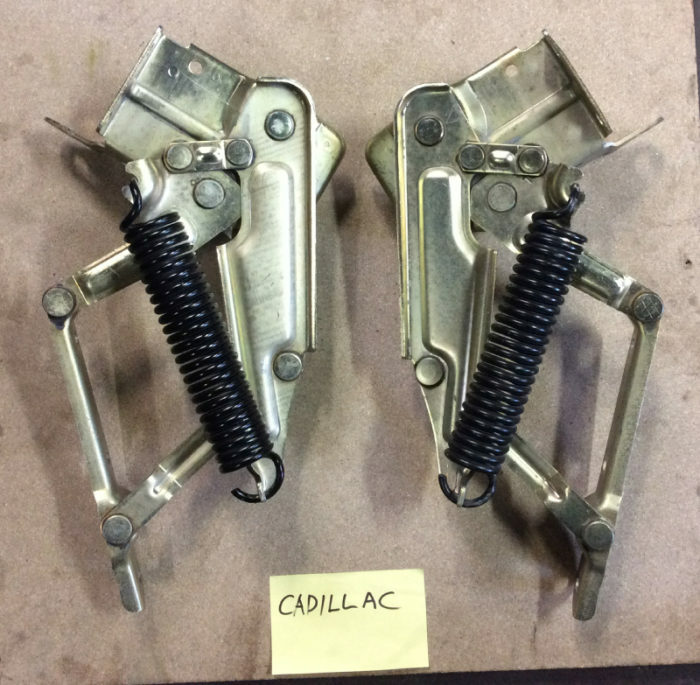 The following photos are hinges from a '59 Cadillac. 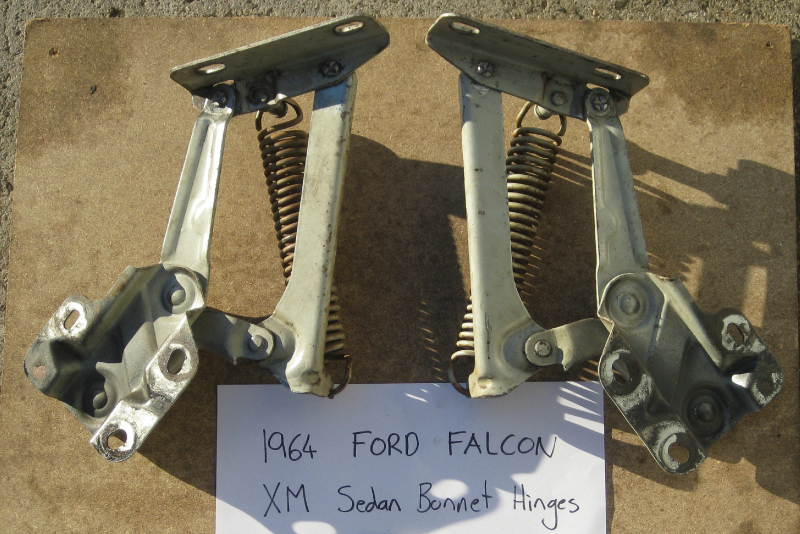 Ford XM bonnet hinges below. Note below that in some cases we do not have to replace all rivets if there is nothing wrong with the original rivets in certain locations. So we replace only worn rivets to remove movement from those areas. Most times we replace all rivets. 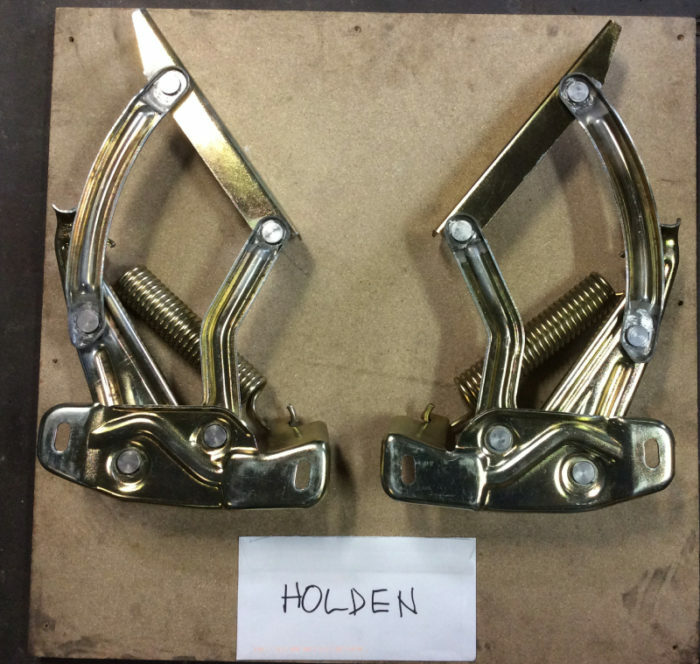 Below is a photo of 3 pairs of finished and reconditioned HQ Holden Hinges which we also had zinc plated.